I have received a few questions asking about Papercut so here are some of the details about it and what we use it for. Papercut can run on a Windows Server (2003, 2008 or 2008 R2) using windows print queues or a Novell Linux OES server with iPrint (CUPS & SAMBA), it is written in Java with some wrappers for the OS in use. We originally ran it on a Server 2003 R2 (x86) but have recently updated to a Windows 2008 R2 (x64)print server. The main reason for the upgrade was to provide up to date drivers for Windows 7 32 & 64bit. We also run the Papercut MF version which costs A LOT more, but allows you to use it with external devices, such as photocopiers. 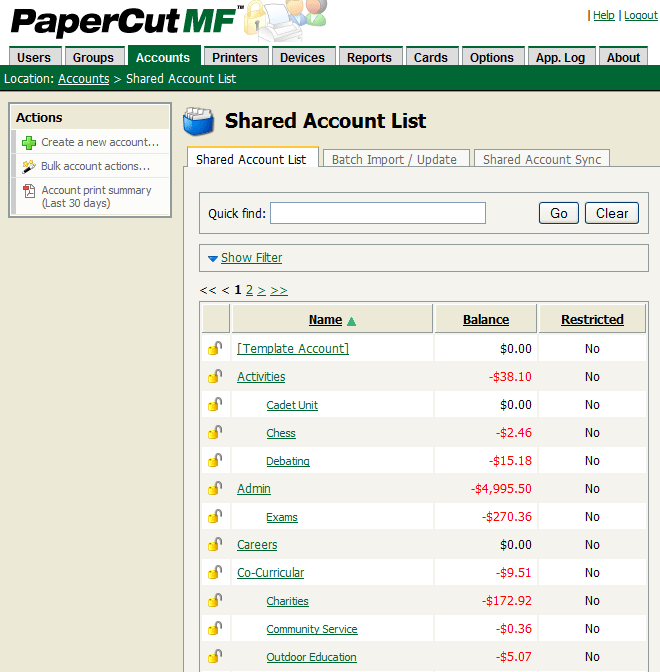 Papercut has some really useful features, Card recharge allows you to generate top up cards and print them out yourself. Then you just cut them up and given them to the office (or canteen) to sell to the students. Makes recharging much easier and no need for office staff to login to an admin console to top up accounts. We recently had a student laptop roll-out (NSW DER), these laptops are not on our domain so needed an alternative way to print. Papercut has a feature called WebPrint which allows students to upload MS office or PDF files to a website and have them printed to the chosen printer. You need to run software for it on a windows pc (server or client) which automatically opens the document and prints it to the chosen printer. As our Print server is running Windows and is a virtual machine we just configured it to auto-login as a limited user we created and installed Office, and Acrobat. We use the reports function for auditing staff accounts and charging printer usage back to faculties. Staff are automatically added to different charge accounts based on their AD group membership. We have just started using Advanced Scripting to charge staff different prices than students on shared copiers and printers. The following script is what we use, as it is based on how faculties are invoiced at the end of each term. It is based on the Papercut recipe “Discount for staff” with a few changes. * Staff are charged based on cost to school. // Record that as discount was applied in the job comment. Students and staff see a summary of how many pages they are going to print, which helps reduce accidental printing of entire chapters of text instead of just a few pages. Logs and statistics show which printers are getting used, how much is getting printed, and who printed the document but didn’t collect it. Great support. I have contacted them over a number of issues and they have always gotten back quickly with good ideas, or have added features in later versions. Although the price for education version of Papercut NG is not too bad, to get the MF version which supports copiers it costs around twice as much. Also you then need cost recovery devices for the copiers ~AUD$1,800 each, and there are annual support and maintenance costs ~AUD$1,000/year. If you want to get an idea of how much printing your staff and students or just want to keep a record of who is printing what (like you could do easily with iPrint) try the free Papercut Print Logger. This entry was posted in Linux, Novell, Utilities, Windows and tagged Papercut, Photocopier, photocopiers, Printer, printer usage, Printing, student laptop, Windows 2008, Windows 2008 R2, Windows 7. Bookmark the permalink. I like your print script. If you hit the “Share” button above the script it will open a email up to submit your script. We’ll then share it across all the other PaperCut’ers.